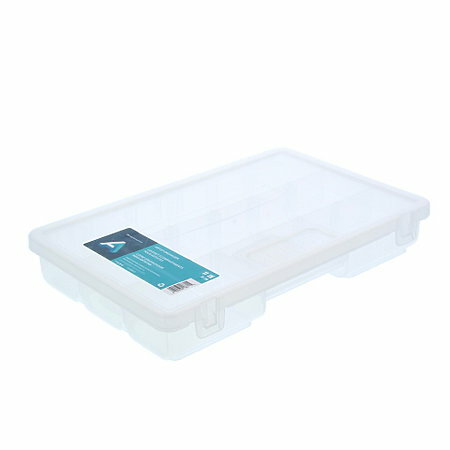 Artist Organizer boxes are a perfect way to store your art supplies. Customize these see-through boxes with removable dividers, great for rearranging and storing your small and medium sized items. Light-weight, peggable and stackable, these durable boxes perfectly store brushes, pencils, pens, erasers, pen nibs, clips, blades, notions and embellishments. The 7.1"w x 5"h x 1.3"d and the 11"w x 7.2"h x 1.7"d boxes features three rows of compartments and the 14"w x 9"h x 1.7"d box features 4 rows of compartments.